Dumas Texas and Dumas Texas Hotels Motels. 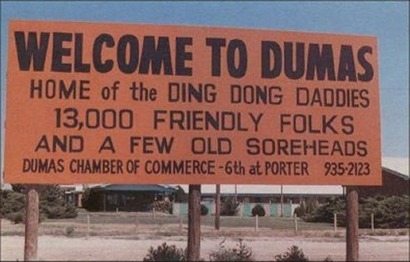 According to the State Travel Guide, Dumas offers "scenic beauty in rugged canyons and hills of Canadian River brakes." Dumas� namesake was Louis Dumas, an investor in the Texas railroad lands. 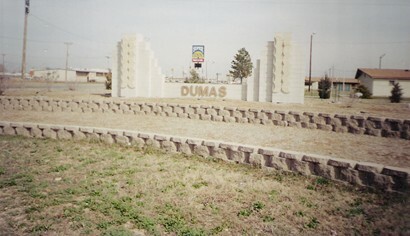 Dumas formed the Panhandle Townsite Company. He and other investors saw unlimited opportunitiest here and after forming the Moore County Township Company, the town that was to bear his name was platted. The first building housed the company office, a hotel, a general store, and the first post office. 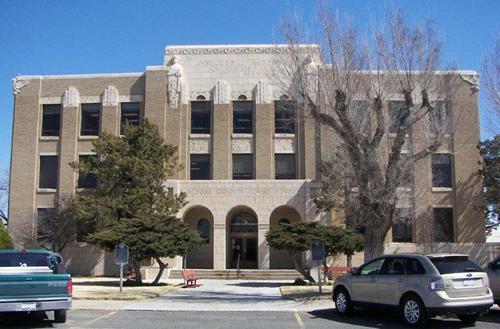 When Moore County was organized, Dumas became the county seat and a courthouse soon joined the other buildings. The town may be on the list of ghost towns if it wasn抰 for the tenacity of the Nield family who toughed it out. 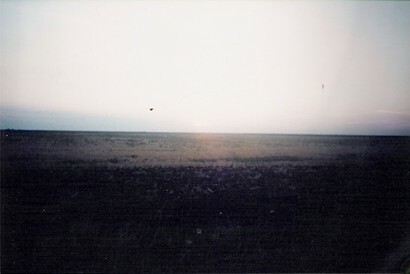 The town was without a railroad connection and any building material or supplies had to be brought overland from Amarillo. The railroad venture failed, but the seed was sown for growth, nonetheless. 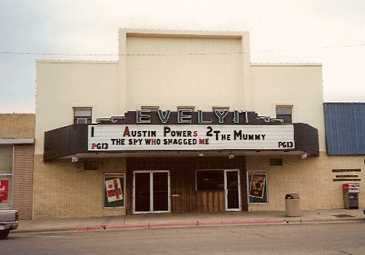 The population doubled to 200 residents. Finally, in the mid 1920s, oil and natural gas were discovered and residents were beginning to feel things were finally changing for the better. A railroad (the North Plains and Santa Fe) finally arrived in 1931 and despite the Great Depression, Dumas expanded. A new courthouse was built and a fire department was organized. The town received its first paved streets. Dumas surprised the census department by reaching 2,500 people at the height of the Great Depression. The installation of several carbon black plants swelled the population to over 6,000 by 1950. The drilling of new water wells and the building of new petro-chemical facilities increased the population to new heights. In 1960 it was 8,477 in 1960 and twenty years later it had reached over 12,000. By 2000 it had reached a population nearing 14,000. Fishing, swimming, boating and water skiing. J.T. Brown - �...When I was in school, the school was up there where the Christian Church is now, up there on west Fifth or Sixth, somewhere in there. There were two big old two-story buildings there for schoolhouses. The class I graduated with in 1931 was the last class to finish in the old school building..."
There were 19 men killed by fire and explosion with 33 people injured. Four men who were fatally injured were employees of the refinery, and thus not included as members of either Dumas or Sunray Volunteer Fire Departments. At least one man (D.C. Lilley) had his name misspelled [on the monument]. His correctly spelled name is D.C. Lilley. As his son I have quite a lot of info on this incident. 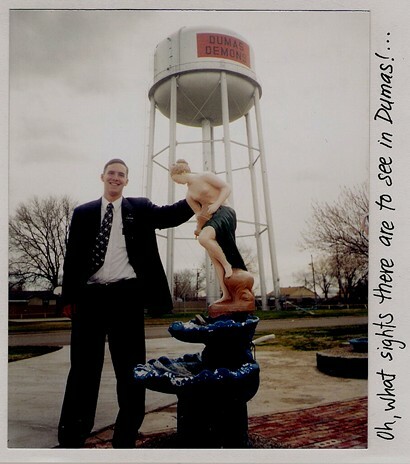 There are monuments in Sunray and Dumas and a 50 year memorial is planned for 2006 in Dumas. The NYC firefighters were all headed upward on 9-11-01. They are among heroes anywhere. Out of over 5 million people, 343 firefighters died that day. On July 29, 1956, nine men ( 8 firefighters and 1 refinery employee) died among a town with a population of 1,240. I consider them all heroes as well as the men who found them and carried them to medical services. (We don't know who most of them were.) They have my eternal thanks. The burial of most of these men was at Lane Memorial Cemetery located one mile N. of Sunray and approx 1/4 mile east on a (now paved) FM road. Four of these men were members of the First Baptist Church of Sunray. They were Broxson, Emmett, D.C. Lilley, and Weir. Funerals were held on July 30 and 31, 1956 with mourners lining both sides of the road from the church to Lane Memorial Cemetery. I lived northwest across from the church and watched these funerals. My father's being the last. All funerals were closed casket from this refinery fire and explosion. My biggest regrets are my family not meeting my father.